Print this Scarecrow out on Card-stock paper. Let the kids cut it out. Laminate during class if you want. Let the kids take these home and hang up on their door. Use Fall Sunday School Lesson to go with this. Comes with Fall Recipes, Cupcake Toppers, Maze, Coloring page, writing paper, activity sheets and so much more. Fall Crafts. We have more Sunday School Lessons that comes with Bible Recipes and other fun stuff for the kids to do. 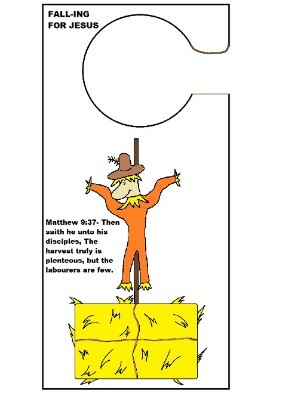 Try printing out one of our Bible puzzles or using some our Free Christian Clipart.